Apprentices’ Strike meeting in Queen’s Park. The national strike by apprentices was to demand fair wages, the right to union representation and an end to victimisation. Apprentices’ wages were extremely low, despite them often been asked to do jobs for which adult workers were paid danger money. It was also standard practice for companies to sack them when they became fully qualified and replace them with new apprentices who were much cheaper. The apprentices’ slogan was `All out together, all back together’ and they were successful in gaining union representation and fairer wages. Have you any memories, new information or corrections relating to this picture? I was born in Bolton and lived at 16 Portugal St Haulgh. I went to the Haulgh (Board) Primary School from 1944 until 1947. I am looking for info address or photos of this area. 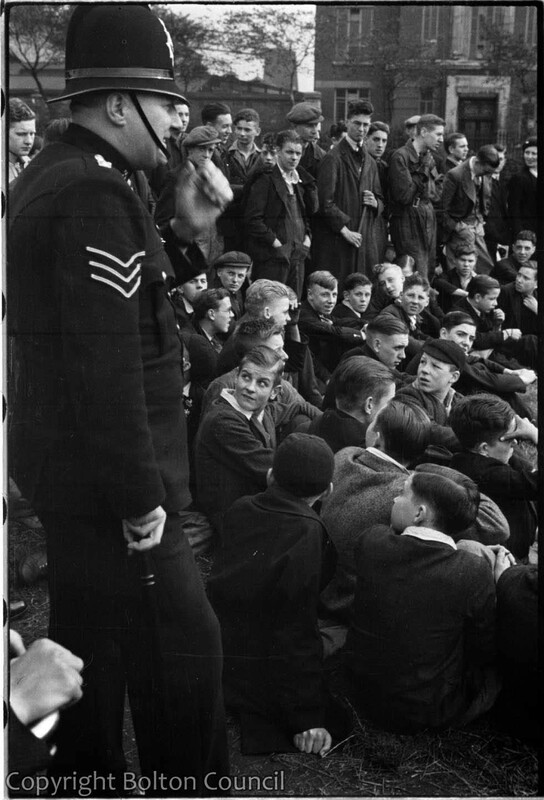 The photograph taken 1.9.1937: therefore, Police Sergeant 3 shown is PS John William Seed of the Bolton Borough Police. He joined the police as PC 92 on 2.4.1919 promoted Sgt 3 on 21.12.1932 until his death on 9.5.1939. I have another photo of Seed and confirm his ID.